Anti-fatigue mat. Feet hurt when you’re standing by the sink or the stove? Love to go barefoot when you cook, but it makes your legs ache? 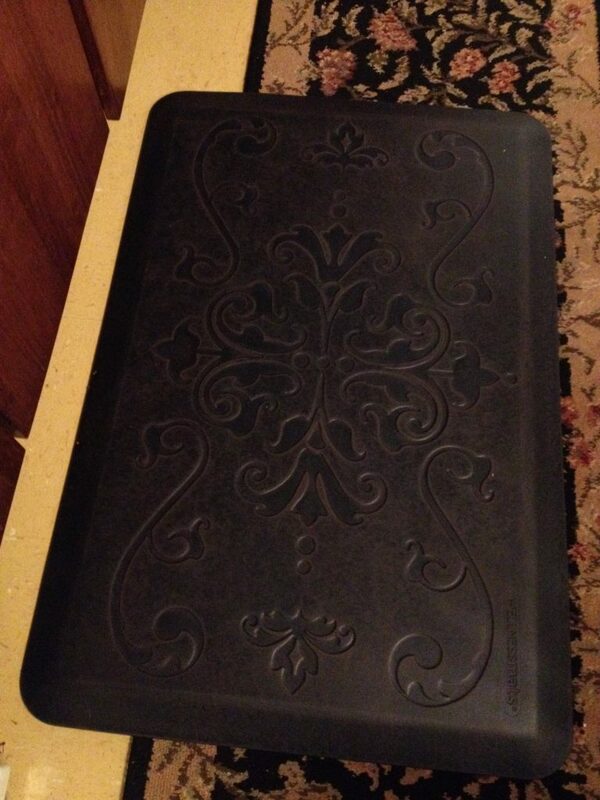 Recently received a sample of a super-cushiony anti-fatigue mat from Wellness Mats. It was a pleasant surprise to feel such firm-softness underfoot by the kitchen sink. The mats have beveled edges, come in multiple sizes, and are guaranteed for seven years not to curl—important to prevent falls—or deform or lose their cushiony-ness. Plus, they’re made 100% in the USA. 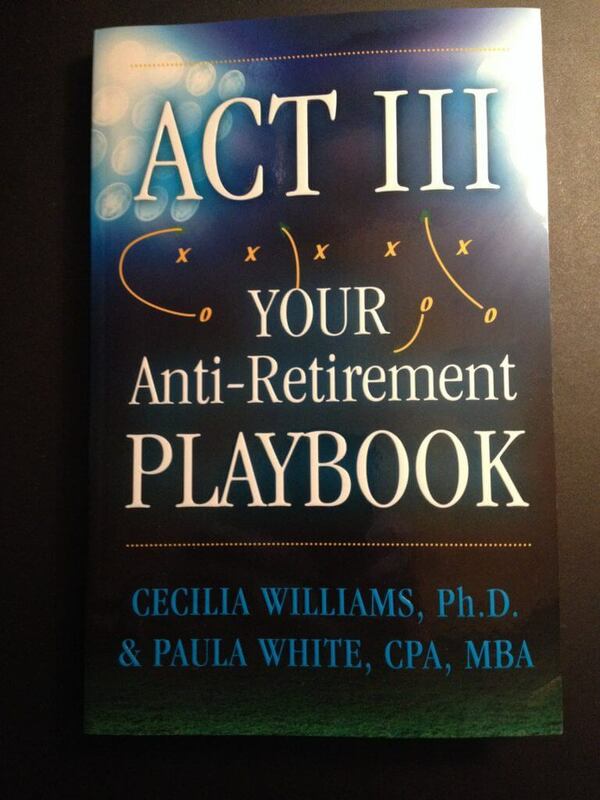 Book—Act III: Your Anti-Retirement Playbook. Received a review copy of this book and found it clearly written, easy to read, and full of positive ideas and practical tips for getting more out of life after retirement, along with a bit of history about the concept of retirement. Did you know the idea of retiring was introduced in most countries only in the late 19th century? Before that, people didn’t live all that long, and so mostly they just worked until they died. Lucky for many of us, we get to think creatively as we age about how we want to nurture our interests and even expand our relevance. And even if you’ve already settled into a nice routine, the book may help you discover something new about yourself and what you care about. It takes a straightforward, no-nonsense approach to finding and pursuing your purpose in life—I think it would be good for anyone—even younger—who has free time and for whom the bills are mostly taken care of. Written by Cecilia Williams, PhD and Paula White, CPA, MBA. Price ~$15 ($9.99 for Kindle). Book—How Memory Works—and How to Make It Work for You. Are you lost without your smartphone? Can’t call your friends without speed dial? Never remember names? A review copy of this book reveals that its title is succinct and accurate—it contains a lot of scientific research about memory, explains a number of common tricks (acronyms, acrostics, rhymes) to sharpen mental skills, and gives practical tips to strengthen your memory as well as exercises to test yourself. 7organize it, if possible, into categories (which automatically reinforces meanings you’ve attached per #2). The chapter on “Remembering Life” may particularly appeal to anyone thinking of writing a memoir. Did you know that people over 50 tend to most vividly recall, except for very recent events, their memories from ages 15 to 30? Though clearly written, this is a complex book. Not designed for a quick read but very good if you’re seriously into the topic. ~$12 paperback or e-book. $9.99 for Kindle. Book – The Noticer’s Guide to Living and Laughing: Change Your Life without Changing Your Routine, by Margery Leveen Sher, gives readers a light-hearted guide to paying attention to the ordinary people, places, things and events that make up a typical American life. Her premise is that we are overly scheduled and too much on our screens, that our anxiety is increasing, and that there’s a realistic solution. Her book relates anecdotes about her life and offers tips on how to enjoy and appreciate life more by truly noticing the things and people around us. She says “Noticers” seem to have less anxiety, experience more joy and make deeper connections. Even though the author is a professional life-work-balance consultant, she writes in a cheerful, easygoing voice. The conversation-starter ideas in each sub-chapter consist of questions you ask and answer with grandparents, kids, friends or co-workers. Resulting discussions might be like little mini-workshops you conduct together. The ideas encourage talking to each other about simple things that are worth noticing—some cute, some tough (like how to act when we make a mistake), and some that are just there (like the stuff that accumulates in closets and junk drawers). She uses quotes from great authors and often suggests conversations based on content from books. This one’s an easy read. Something you could keep on a shelf by the coffeepot to leaf through each morning and pick something to notice that day. Price ~$12 paperback, $6.99 Kindle. Book – Cookies & Beer: Bake, Pair, Enjoy by Jonathan Bender. Yes, you read it right: Cookies and beer. While this may seem like heresy, the more you read about it, the more sense it makes. Both things have important ingredients in common: grains, spices and fruits. The book points out how the perfect beer can bring out unexpected flavors in a cookie, and how the right cookie can awaken flavors hardly noticed before in a beer. You can tell this guy’s a food writer. This book is fun to read and dream about—even if you never make any of the recipes. Price ~$15, $9.99 for Kindle. Even though most of us don’t need more “stuff,” it’s still fun to give a gift someone can really use. Here are a few ideas (one product and four books) for those over 50 who still love giving and getting useable—books are also recyclable—gifts. Like to exercise while you’re watching television, and so on. You can buy cheaper mats, but many are more industrial-looking. These will go with almost any décor. Prices range from ~$70 for a small companion/travel size, ~$130 for a 2’x3’ professional-grade for medical, industrial apps, to $260 for a 6’x2’ mat from one of the designer collections. The designer collections are beautiful and look classy on your floor, almost like a sculpted rug.